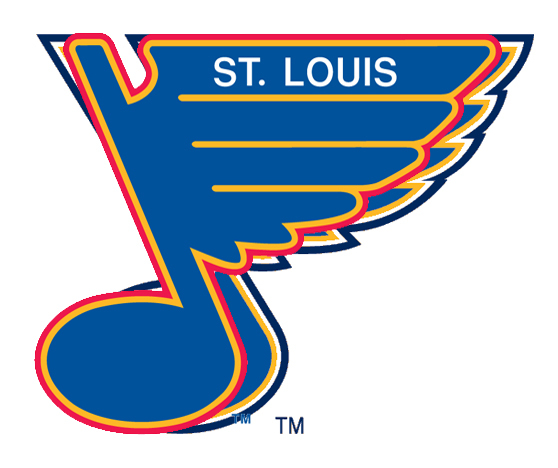 Of the four remaining logos, three of them have wings featured in them (Detroit, Philadelphia and St. Louis). Two of them have wheels (Boston and Detroit). I didn’t necessarily plan it that way, but I don’t think it’s by accident. You know what wings and wheels have in common? They imply movement, dynamism and speed, all elements that are fundamental to the game of hockey. In 4th place comes the Blues, a logo that I think is probably the most under-rated in hockey. It’s the Pete Postlethwaite of hockey logos – can always be counted on to give a solid performance but doesn’t get the recognition he deserves. Although, according to IMDB, the most under-rated actor ever is Ed Lauter. I don’t know about that. Pete Postlethwaite is amazing in any movie I see him in. The Town, Inception, The Usual Suspects, he’s always a good choice for a casting director. 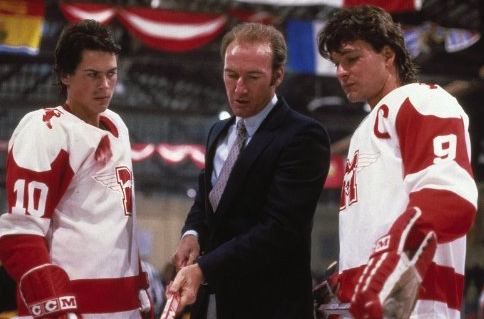 Although Ed Lauter does get points for being in an actual hockey movie, Youngblood. But, I digress. The Blues are named after the song “St. Louis Blues” by W. C. Handy from 1914, a blues classic that’s been recorded by people like Louis Armstrong, Ella Fitzgerald and Billie Holiday. It’s a sad song about a woman missing their significant other, so naturally, they decided to name a hockey team after it (Whaaaaa?!). For a designer, I don’t imagine coming up with a design concept could have been easy. A music note seems like a natural place to start. And adding the wing works, giving it movement and making it unique. 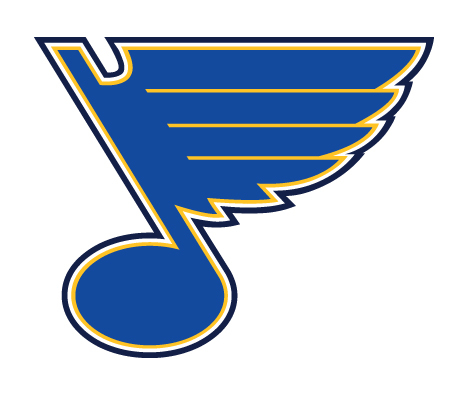 At the same time, the Blues’ logo is an exercise in the importance of details, as its previous iterations would not comes close to the top of the list like this one. 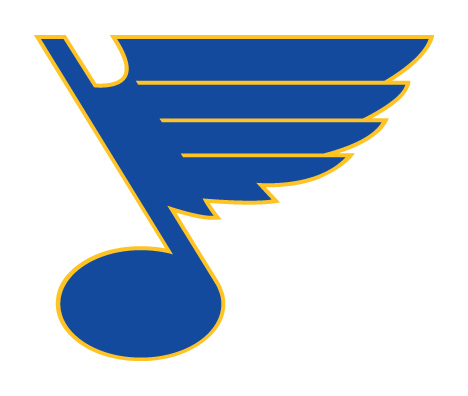 The original Blues logo (from 1967–84) feels off-balance. The angles are too soft, the curves are poorly done, the notch at the top-left corner of the logo is poorly executed, with a blotch of yellow drawing your eye. The 1984-87 logo has this awful domineering font and a typewritten “St. Louis” taking away from a more refined winged note, which is actually quite close to the current one. And they threw in an extra colour just to mess things up. The 1987-98 logo went back closer to the original logo, but even stubbier and rounder. That being said, the overall concept hasn’t changed since the original, and once refined properly, their current logo shows the true potential of the original idea. There are three relatively small changes between the current logo and the previous one that make a huge difference. One is more obvious, which is dropping the red and simplifying the colour scheme, which works great. The second is the angle that the note’s stem leaves the note’s bulb at the bottom. That small change makes the logo a little more dramatic and gives it more movement. The last change that make this logo great is that the length of the wing is slightly extended, again adding more movement. It’s these small details that, overall, makes the logo more intense, gives it more strength and more movement. And than there’s the balance of the logo. Have you ever tried balancing on a ball before? It’s not easy, just ask this guy. And that’s what essentially this logo is doing, and what its previous iterations failed at. The balance is achieved by being able to see it both as nothing more than a music note with wings, or as a wing with a base. This sounds kind of weird, but it’s like the faces in the vase effect, albeit without the hidden image trickery. If you focus on the music note, the logo is being pulled to the left. If you focus on the wing, the logo being pulled to the right. It’s just balanced so nicely. Other things to note (see what I did there? ): the raggedness of the wing on the right adds that level of intensity and fight that personifies hockey, which is again something the previous versions of the logo didn’t have as much. And also, it’s executed well because everything lines up so nicely. The left side of the wing’s lines are perfectly aligned with (and at the same angle as) the jagged edge of the second last portion of the wing, and the notch at the top. The angles at the wingtips are also the exact inverse angle, giving the logo more balance overall. The notch at the top is well done too, although perhaps it cuts a little deep, as it almost touches the top yellow line of the wing. Maybe raise that just a tiny bit? One thing that I’ve generally been against over the course of this countdown is too many outlines, and this one has three: yellow, white and a darker blue. This is one of the few occasions where they all feel necessary and it works. The yellow outline fills the gaps in the lines in the wings. Leaving it at that makes the logo look too flimsy, and as yellow isn’t a strong contrast to a white background, the logo would just kind of fade to nothingness. Getting rid of the white outline, and just having a yellow and blue one is better, but makes the logo too heavy and fighting against the movement in the winged note. Adding the white outline gives it the strength and lightness to compliment the shape. I’m not necessarily crazy about the amount of outlines, but like I said, it works. So, this logo comes together through its attention to the details – to the angles, the outlines, the balance – that come together better than any other version that existed before. It’s got movement, grace, intensity and strength. It’s totally underrated and deserves to be 4th. To be honest, the gap between 1st and 4th is incredibly small. If I had a couple more White Russians while typing this and feeling a little more bold, it could have even been first. And yes, that totally random Big Lebowski reference was totally necessary. Totally. And I actually prefer Black Russians, thanks. This is my favorite write-up so far. I agree with everything, and I really enjoyed your discussion of balance and angles. It helped that your illustrations were very well done. Thanks! It was a fun one to talk about for sure. Great logo. It seems simple enough, but you do a good job pointing out the art of balancing it properly. Also, the older versions would not make my top five, so it is the sharper angles and proper choice of outlines that really make it work. I like this logo better than the B’s, but no point in nitpicking here at the finish line. Love the fact that the ‘note ‘also resembles a hockey stick with puck on it, then again I saw a hockey player inside the Phoenix logo… maybe too many white russians? Careful on the alcohol there Duff. Pete Postlethwaite actually passed away last year. RIP, Pete. Yeah, I know. It was sad to hear. Great actor. There was another change in the note that you missed. For 2 seasons (87-88 and 88-89), the note had pointy wing tips. They didn’t round them out until the 89-90 season. 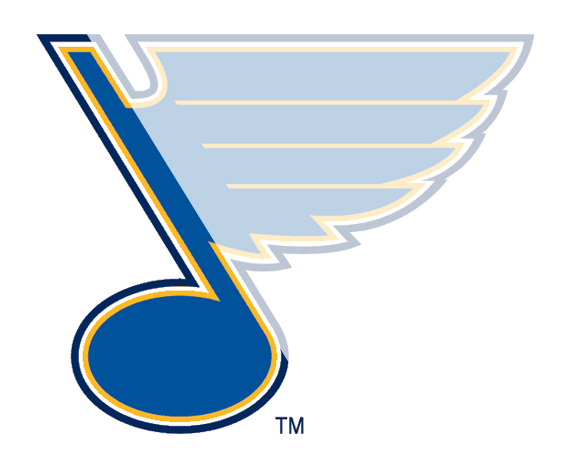 It looks like the pointier version came from their previous logo (with the giant “Blues” written over top), which is very similar to what they have now, and then they changed it to the stubby version, for some reason of which I can’t fathom right now. I have no idea why they did it either. It’s especially awful because I associate that logo with the Keenan era diagonal strip uniforms. Creamer’s site is amazing and I spend way too much time on it. 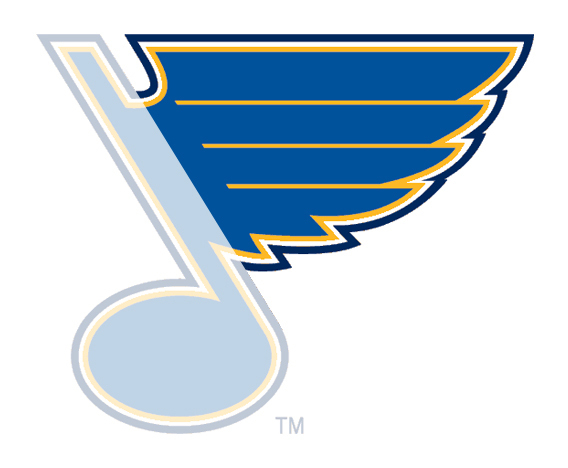 I’ve always wanted to send him the missing Blues logo, but I’ve never actually been able to find a decent picture of it. Even the Blues’ own official website has it wrong. Haha, looks like they took it straight from Creamer’s site as well. I’ll try to put this to good use imeltiadmey. Cool website. I have enjoyed reading your reviews. Personally, I disagree with a lot of them but overall it is a good list. It would be interesting to have a voting application on your site where users can rank all 30 teams themselves and keep an overall tally of which team ranked where. 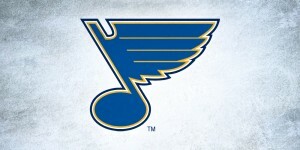 Blues is a good logo though, and definitely worthy of the top 10. 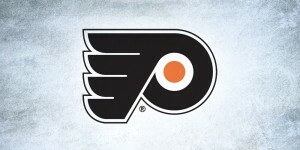 I am surprised the Flyers are still available, I think that is a pretty damn ugly logo although I know it is iconic. The problem with a lot of the picks is that they are based on history and nostalgia rather than just design. I suspect that if this was a brand new league with 30 new teams that the list would look much different. Would teams like Rangers and Flyers really be in the top half? I doubt it. 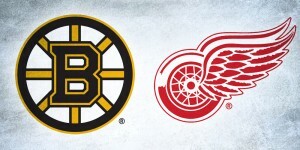 I’ll predict that Detroit is #1 overall at this point, great logo. Got to disagree with you emphatically on the nostalgia vs. design. Just compare the Habs review to the Blues review. But I like there have another teams of nhl, there some of logo The animals! Ducks, Coyotes, Predators, Pathers, Canucks (Whales), Phoenix, Habs = (horsehoes) (Montreal) Bruins (bears) = (boston) But do not like Sharks and Buffalo!.. The blues is power by the “songs” of the music notes!.. Forgot one more other animals, a wild. Can’t tell if this was omitted or it’s supposed to “go without saying”, but the wings aren’t added, they *are* part of a music note, albeit highly stylized. It’ll be nice when one of our playoff runs lasts longer than one of those such notes! Don’t use Creamer’s site for Blues logo reference. There’s so many misnomers and inaccuracies on that site. That image you used for the “Original Logo” is not the original logo. That ’84–’87 logo you referenced is incorrect since that is the Current logo altered to have a red outline and the typeface that “ST. LOUIS” is set in is incorrect. If you would like an accurate history of the Blues logos I can help you. Yeah, I’ve seen there’s some inconsistencies and errors on his site. I’ve talked to him about it and he’ll be making a bunch of adjustments shortly, so hopefully he’ll get the Blues logos sorted out as well. Remember, this post is almost 5 years old too, so a new BTLNHL Countdown (along with all the different logo changes in the league in the past 5 seasons) may be in order soon.